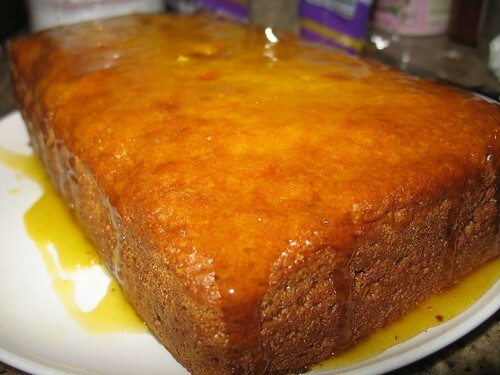 New Wave Domesticity: ooooh my darlin clementine..vegan cake! last week, i realized that my big wonderful bag of clementines (left over from the clementine cupcakes last week) were getting a little shriveled and i was just not going to be able to eat them fast enough to safe them. then i remembered that i saw a recipe on the vegan yumyum blog about candying clementines and a clementine cake, so i got to work! when you candy citrus, it makes the peel and rind completely edible. 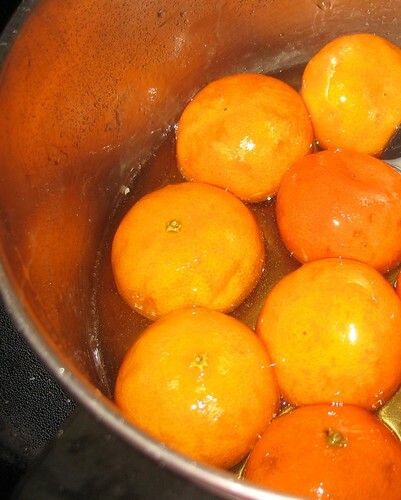 i had about 8 or 9 good clementines left, so i pierced them 8-10 times and added them to about 3 1/2 cups of sugar and 2 3/4 cup of water in a big pot and let them simmer for about an hour (according to lolo, you can simmer these for 1-2 hours, but the longer you simmer - the more bitter they will be). 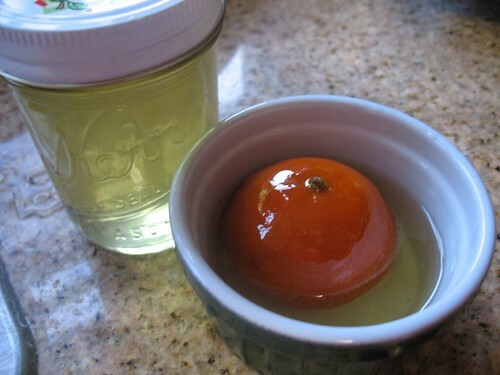 i was hoping to get a nice sweet candied clementine out of this process that i could maybe eat up with some cream fraise or something, but mine turned out quite bitter after an hour and i am not sure that i could deal with the idea of eating them just as they were. it might have been some mistake i made along the way, but after i drained the clementines out, i did end up with clementines with edible peel that were great to blend up for the cake and also some wonderful clementine flavored simple syrup for drinks and desserts in the future (make sure you save that part!). next, i started making the cake. i blended up the drained clementines with my emulsion blender to get about 1 1/2 cup of puree and added it to: 1/2 cup vegetable oil - 1 1/4 cup soymilk, or other non-dairy milk - 1/4 cup sugar - 2 cups all-purpose flour - 1 1/2 tsp baking powder - 2 tsp baking soda - 1/2 tsp salt. and i baked it for about 45 minutes on 350.
i also attempted the fondant on lolo's site, but i failed and it became more of glaze...which was less pretty, but very yummy. really, you just need to make sure you look at the vegan yum yum site because her photos are a million times more elegant than mine and she has a lot more detail on the process which is really helpful. after all was said and done, there were some things that didn't work out just right, but it made a really good vegan cake with a nice balance of savory and sweetness. i brought the cake to work and my coworkers all were really into it and i got a ton of compliments, so i will call it a success.